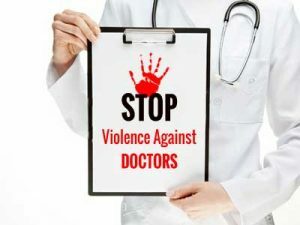 Medical Dialogues team had earlier reported that around 70 resident doctors of MV hospital in New Delhi had gone on strike after their colleague was assaulted by the patient’s relatives at the hospital. Doctors had lamented that the resident doctor assaulted had to himself go and file a personal FIR with the police, even when the Doctors Protection Act calls that institutional FIR had to be filed in such cases. A meeting was held between the RDA representatives, FORDA representatives as well as the hospital authorities with the health ministry officials. The ministry noted that in this case, since the FIR has been already lodged individually by the Senior Resident himself, the MS is advised to ensure proper follow up of the FIR lodged. Further the secretary directed for explanation of the WO on duty during the time of assault of the Resident Doctors should be obtained for not registering the institutional FIR. Whenever, a, instance of assault on the resident Doctors is reported institutional FIR will be registered by the CMO/MS of the concerned hospital. MS should convene regular monthly meetings with the representatives of the Resident Doctors to address their grievances, if any. RDA Welfare Committees as existing in some of the Central Hospitals to be constituted by the MS and meetings of these committees should be conducted regularly. Th Resident Doctors-should call of the strikes immediately.